A week of beach volleyball at the Indian Ocean; exploring the island, surfing or just relaxing. Great people, delicious food, cool cocktails and breathtaking sunsets on the finest sandy beach of Ahungalla makes your stay an unforgettable adventure! 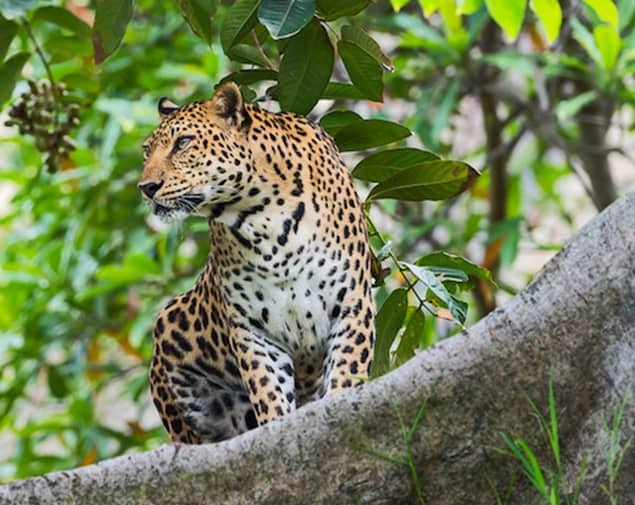 We have a very limited number of spots at our camp weeks in Sri Lanka. Book soon to make sure "your" week isn't sold out. Play as much as you want from sunrise to sunset. 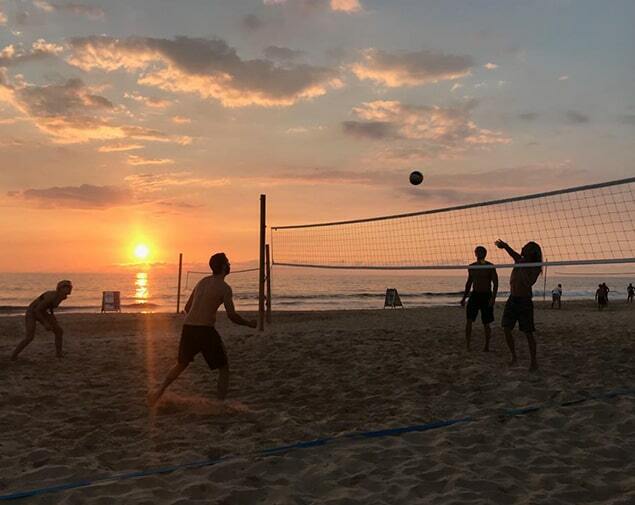 For this we build up to five courts on the best spot of the beach. Play our tournaments organized by us or simply hang back and cheer for your friends at our private beach bar. Enjoy the silky sand between your toes while challenging other players in hot games. The Indian Ocean awaits when you run out of steam and need to cool off. We cater for training and game balls so you don't have to carry them around the world. Book your spot in one the bungalows, with a 96% rating, right on the beach by the beach volleyball courts. They sleep 4-6 people and have a fully equipped private bathroom with shower and free toiletries. By request, a bungalow can be made private. Alternatively, we help you book a single or double room in the nearby Hotel Villa Ranmenika. Breakfast, lunch and dinner are buffet style and include; Continental, Asian and Halal options as well as local specialties, seafood and Asian cuisine and vegetarian dishes. Water and bananas are complimentary during your whole stay. Sri Lanka is one of the most beautiful places for surfing. In the warm Indian Ocean you can stay out there, on your board, for hours without a wetsuit. 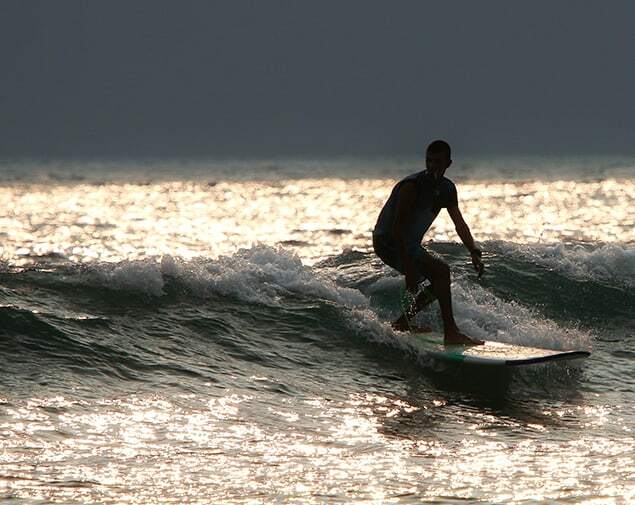 After a 30 minute drive you reach Hikkaduwa, the closest surf town in the region. We will gladly organize a tuktuk and help find the best surf schools. If you are staying longer we also recommend checking out more surf spots along the south coast. Can't surf yet? No problem, when you book a surfing package you have the option of adding a private instructor teaching you how to catch your first wave. 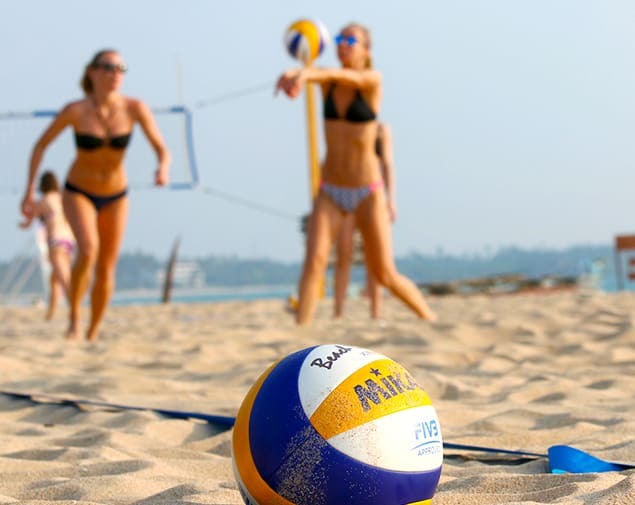 Would you like to learn how to play beach volleyball? Do you want to get improve your game? Is the timing of the attack a mystery to you and you finally want to know how to do it right? We always have experienced coaches on site, where you can book private training sessions. It does not matter if you are alone or in a group and you choose what to work on with your coach in each session. Action or relaxation? Culture or Adventure? We have put together a selection of great excurions and adventures for you. All options are available to book onsite. What about; a visit to the town of Kandy, making the spiritual ascent of Adam's Peak, hiking through the rainforest or watching the giant of the sea. Booking the flight to Sri Lanka is done separately. Search for the best offers through www.google.com/flights or similar. Find yourself a cheap deal to Colombo Airport and from there we can assist with the airport transfer to the Jungle Beach Resort. Make your transfer request after booking the camp and when you have all your flight details sorted out.